After a short 20 minute drive from the Dalaman airport, arrival to the charming town of Gocek will set the beginning of your travels on one of the most beautiful blue cruise Turkey journeys in the Mediterranean. With a prime geographical position, the port of Gocek and the town itself has become one of the favored hot spots for International yachtsman and global travelers alike. From the high end mega yachts to the small wooden boats, the many bays, coves and islands surrounding Gocek are one of the few destinations on earth that yachting enthusiasts can cruise all year long. With an ongoing expansion to its existing marinas and harbor, Gocek has become the starting point of quality Turkey yacht charter holidays. Tucked away in between the lush green forests and turquoise blue sea, it is a place of many magical treasures for all the world to enjoy. There are a variety of combinations designed to enjoy a Mediterranean yacht charter. Whether on a Turkish gullet cruise or a motor yacht charter, from the port of Gocek, travelers can make choices in the destinations they wish to visit. One such choice is detailed below. 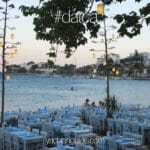 After a 20 – 25 minute drive from Dalaman Airport, you arrive in Gocek. Boarding begins at 3:30 pm at Gocek Marina. Once you have settled in, met the crew, gone over any details that need attention such as your itnerary, you will have time to yourselves to relax and unwind. 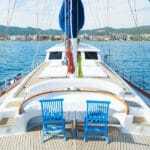 This same night you will be served your first blue cruise dinner on the yacht and will spend a night in Gocek Marina. Alternatively, you can also enjoy a quiet nights’ rest in a nearby bay within the Gocek 12 Islands. However this alternative choice is only possible if it is not dark. This is your actual first day of cruising. On this day places that will be visited are Oludeniz, Soguksu Bay and Gemiler Island. If you have not gone over your itinerary from the previous day, then today will be a good time to talk about it with your captain and crew; along with the safety procedures of the boat. Shortly after your breakfast, your private yacht charter will set its first course to the famous Oludeniz. Otherwise known as the Blue Lagoon, Oludeniz presents an intriguing beauty of hidden paradise where you can truly enjoy a delightful swim in the calm waters or relaxing with the peaceful sounds of nature. Your boat will be anchored at Soguksu Bay for lunch where afterwards you can again enjoy a leisure time with your group or on your own. The next stop – Gemiler Island. While visiting this lovely place, you might like to take a casual stroll to visit the Church of St. Nicholas. During the early morning hours your private charter boat we will set course to cross over to Yedi Burunlar (Seven Capes) and drop anchor in Yesilkoy Bay. Here in this breathtaking region, you are close to the charming town of Kalkan. Breakfast will be served here, followed by free time to enjoy the sea. The town of Kas will be the next place of anchorage. There will be another break for a swim. Kas is one of those must-see places in Turkey’s southern coast. Once here you will have the opportunity to walk around the town. Kas was once an old Greek Town. It is known for its entertaining nightlife and considered one of the most important places during the Lykian period. According to history, Kas gained significance during the Roman times and eventually became the center of jurisdiction during the Byzantine period. On your fourth day, you will visit one of the major highlights of this gulet cruise. Shortly after a lovely breakfast on board, your gulet will cruise to the Sunken city of Simena in Kekova. Here you can enjoy a swimming break. Lunch will be served in Tersane Bay. For the night you will be anchored at Ucagiz Bay. 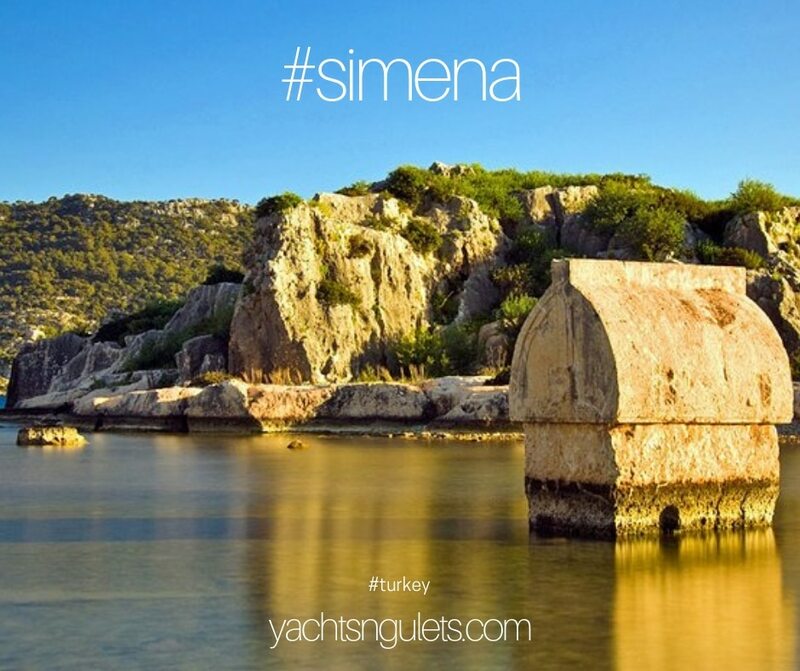 A popular Lycian site, Simena is situated upon one of the most attractive coastal locations in Turkey. The name “Kekova”, when translated means “plain of thyme” and describes the region enveloping the island of Kekova, the villages of Kalekoy and Ucagiz and the three ancient towns of Simena, Teimussa and Tersane. The name Tersane means “shipyard”, as its bay was once the site of an ancient shipyard with Lycian and Byzantine ruins. You will still be in the same area on this day and after your breakfast, you might wish to go ashore for a small hike upwards to take some photos of one of the most beautiful sceneries on this trip. Kalekoy castle ruins are a part of the ancient city of Simena in antique Lycia times. 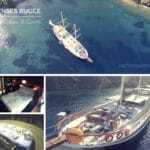 It is quite a popular must-see location on gulet charters in Turkey – especially if you are already in the Antalya region. Your ‘sea view’ lunch will be served at Gokkaya marina where you will anchor for a swim. For dinner and overnight stay you will be anchored at another wonder of natural beauty, the Ucagiz Bay. 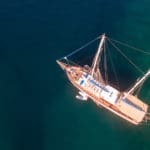 Today, a gulet cruise after breakfast will bring you to drop anchor in Bayindir Bay and enjoy the beautiful waters of the Mediterranean sea and have leisure time with your group or on your own. Lunch will also be served here. Shortly after a delicious lunch your yacht ill travel to the marina in the splendid town of Kalkan. At this time, you will have the opportunity to participate in the Lykian Cities’ Tour for added fee. These amazing historical ancient cities include, Xanthos, the capital of Likya, Patara the city of trade and harbor, Tilos the city of sports, and Letoon, one of the most important centers of religion during the Lykian period. For another additional fee, a visit to the famous Saklikent Canyon / Gorge can be included as well. However during the summer months, the canyon can get too hot to be outside. Later on in the day you will be served another tasty blue cruise dinner and will overnight in the charming Kalkan harbor or Yesilkoy Bay. After a lovely breakfast in Kalkan or Yesilkoy, an early start to the day will take you to the breathtaking Camli Peninsula. From this point a beautiful yacht cruise to anchor in Batikkaya where you will enjoy a lunch on deck and then have time on your own and with your group for swimming, water and other leisure activities of your choice. Since this is your last night on board, you will have the opportunity to explore the pleasant town of Gocek after dinner. Alternatively you can remain within the Gocek islands’ region as well. Today you will wake up to your last breakfast on board your private yacht charter, in the impressive surroundings of Gocek. Depending on the time of your departure flight, you will be transferred back to Dalaman International Airport with memories, we hope, that will make you wish to come back again for another blue cruise holiday in Turkey!